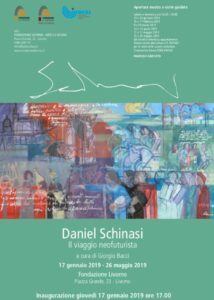 L’Istituto Italiano di Cultura di Belgrado presenta una retrospettiva dell’artista Daniel Schinasi fondatore del Neofuturismo. La mostra, curata dalla figlia Sarah che sarà presente all’inaugurazione, copre un vasto periodo della produzione dell’artista. Una trentina di opere rappresentative dello stile del Neofuturismo e dedicate prevalentemente alla musica e allo sport, in cui i protagonisti sono il movimento e la dinamica che si traducono con il colore e la forma. Riprendendo i risultati estetici di Umberto Boccioni e Gino Severini, Schinasi elabora una nuova etica della pittura futurista volta al recupero dei valori umanistici che hanno caratterizzato la storia dell’arte italiana. Protagonista insieme a Carlo Carra’ e Giorgio De Chirico del rinnovamento dell’arte italiana in chiave europea, lavora anche a Parigi a fianco dei massimi protagonisti dell’arte contemporanea. Pittore di grande forza narrativa, oltre alle numerose esposizioni personali internazionali, si dedica alla composizione di grandi murales e opere di arte pubblica in cui dà rappresentazione ai valori umanistici del Neofuturismo. Italijanski institut za kulturu u Beogradu predstavlja retrospektivu umetnika Danijela Skinazija, osnivača neofuturizma. Ova izložba, čiji je kustos njegova kćerka Sara koja će biti prisutna na otvaranju, obuhvata značajan period njegovog stvaralačkog rada. Biće izloženo tridesetak dela u stilu neofuturizma, pretežno posvećena muzici i sportu sa protagonistima u pokretu i dinamici izraženim bojama i oblicima. Polazeći od estetskih rezultata Umberta Bočonija i Đina Severinija, Skinazi razrađuje jednu novu etiku futurističkog slikarstva okrenutu vraćanju humanističkih vrednosti koje su okarakterisale istoriju italijanske umetnosti. Sa Karlom Kara i Đorđom De Kirikom, koji su pretočili italijansku umetnost u evropsku, radi i u Parizu zajedno sa najznačajnijim protagonistima savremene umetnosti. Slikar velike narativne moći, pored brojnih samostalnih izložbi u inostranstvu, posvećuje se i izradi čuvenih murala i umetničkih dela na javnim mestima u kojim predstavlja ljudske vrednosti neofuturizma. Die monografischeAusstellung der Werke von Daniel Schinasi, Begründer des Neo-Futurismus, kehrt nach einigen Jahren nach Wien zurück und beinhaltet auch zahlreiche erstmals gezeigte Bilder. Es handelt sich um eine Anthologie der künstlerischen Entwicklung von Schinasi. Wednesday 21 , visit to the Gallery of Arts in Tirana, with the director Artan Shabani and many other artists. Sunday 18th , a celebration of his 81 birthday will follow with a reception at the Residence of the Italian Ambassador Massimo Gaiani, during which will be screened in private, the movie about him, The Italian Jew of Alexandria with the presence of one of the two film directors, Giuseppe La Rosa. Will be present as well as numerous Albanian artists, the Ambassadors of France and Israel. On the mornings of Monday 19th and Tuesday, May 20, 2014 doubleheader with the students of the Department of Visual Arts University of the Arts in Tirana and Shkodra those of the Academy of Arts for a masterclass during which the artist will exhibit the ideas of the founders his way of making art and will work with the students of the class of frescoes. On the afternoon of Monday at 18 in the Black Box room of the University of Arts, the movie by Giuseppe La Rosa and Oliviero Olmi will be screened opening to the public, in the presence of Daniel Schinasi and director Giuseppe La Rosa. Wednesday 21 , visit to the Gallery of Arts in Tirana with the director of the University Artan Shabani and other artists. “The Italian Jew of Alexandria”, try to condense into 36 minutes, the dense artistic career of the famous painter who was born in Alexandria of Egypt born on 17 May 1933 by the family of Sephardic origin from Livorno. Daniel Schinasi now shares his time between the French Riviera and the Tuscan countryside. The documentary begins in the spring of 2009, when the municipality of Cascina, near Pisa, commissioned the “Maestro” Schinasi a series of paintings to celebrate the 400th anniversary of the invention of Galileo’s telescope. The artist leaves Nice at the time of the Casino of the Earth to begin the work. As he works, the artist confesses to the camera, as reflected in the mirror of the canvas. Talk to friends, with his wife, with himself. 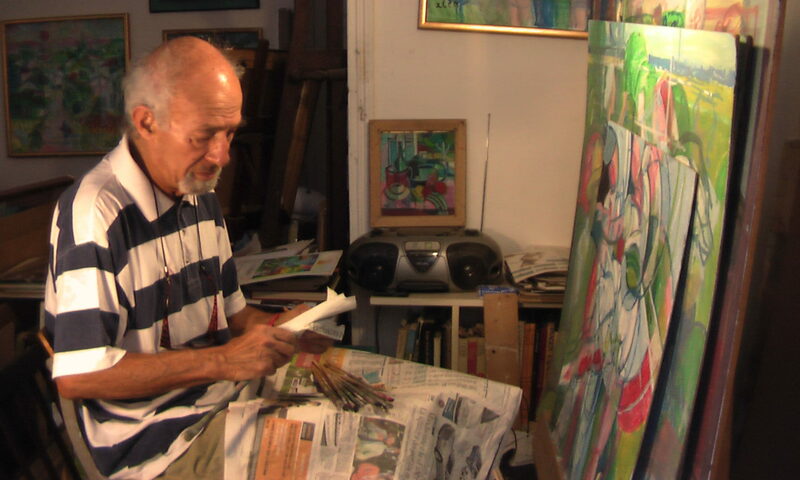 The memories of a life emerge gradually and the viewer discovers that there are many things that he draws from his past and pours into his work. The shapes and colors are born and develop themselves from the memories, the painful exile from his native land of Egypt still burns and moves the soul of the artist. So we find out how he built the style that distinguishes him today, and we understand how to perform such a task, it is necessary to take stock of a life that, in his case, he has always been a challenge. Throughout the visit of Daniel Schinasi in Tirana, a young team of Albanians film-makers will film a short documentary. Thursday, September 12 at 18.30 at the Piaggio Museum in Pontedera inaugurated the retrospective exhibition of Daniel Schinasi entitled FROM ‘THEIMPRESSIONISMO Neofuturism. This will be the Artist. 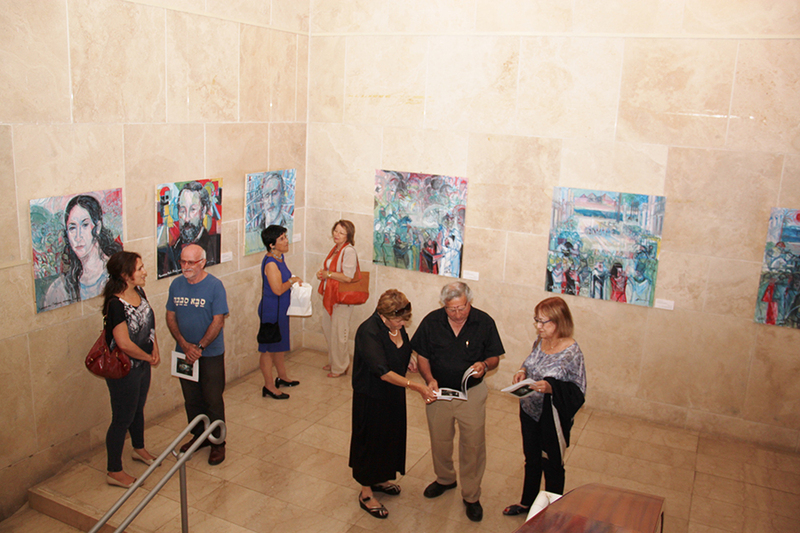 On display are paintings, drawings and documents that range from 1957 to 2013. Tribute to Giuseppe Verdi, with paintings by Daniel Schinasi, founder of Neofuturism. The Italian Cultural Institute in Tel Aviv will celebrate the bicentenary of the famous musician Busseto, and the exhibition will be inaugurated in the presence of the artist and curator Sarah Schinasi. On display are paintings unpublished, created only for this event: portraits of Giuseppe Verdi, the soprano Giuseppina Strepponi, the librettist Francesco Maria Piave, the tenor Mario Del Monaco, publisher Giulio Ricordi, and 4 compositions dedicated to the most famous Verdi’s operas: a Triptych format with images inspired by Aida, Nabucco and Othello, as well as a painting inspired by Traviata. The ceremony will be attended by the Ambassador of Italy in Israel, Francesco Maria Talò, the Director-General Opera in Israel, Hanna Munitz, and the Director of the Italian Cultural Institute in Tel Aviv Carmela Callea. The exhibition will close on 31 May 2013. 9:30 to 20:30, Friday and the eve of public holidays 9:30 to 13:00).